Do You Write in Longhand or Do You Type? Whenever I give a talk about writing, one of the questions that comes up is whether I prefer to write longhand or to use the keyboard. When I started writing over thirty years ago, computers were expensive so I used an electric typewriter. Even then, I wrote my first drafts in longhand, as typing wasn’t something I associated with creativity. It was what I did in my day job. Pen to paper was for creative pursuits. My habit was—and still is—to write a first draft in longhand, using a pencil, type it up while making changes, print the draft out, then make more pencil edits. Since I’m often concerned that I’m not writing quickly enough, I’ve tried over the past three years to write a first draft straight onto the computer. I’ve liked the results, although I still make as many changes as I did with the longhand.approach. Also, I’m one of those people who will write anywhere, and lugging a laptop around doesn’t appeal to me. A pad and pencil is lighter. Even though writing first drafts and making changes on the screen has become more natural, I’m still drawn to pad and paper, and editing with pencil. There’s always been something about the brain-to-hand-to-paper motion that helps me to slow down and think about what I’m writing rather than just bashing out words on a page. I didn’t understand why this process works so well until I came across an article in the examiner which discusses studies on the way the brain functions while working with paper compared to keyboards. One of the studies took 65 college students and gave half of them an offline laptop to take notes while the other half were given notebooks. The results showed that although both groups performed equally well on fact recalling, those who’d used laptops scored significantly lower on their conceptual understanding. The researchers suggested that the typers were taking notes verbatim and not processing what they were hearing while the writers were reframing the lecture in their own words and therefore processing the information better. The article also referenced a 1940s study which suggested that typing essentially robbed the writer of the creative process. The researcher suggested that the word doesn’t pass through the hand while typing but instead appears through a mechanized pressure of the hand and therefore loses something in the translation, so to speak. I think subconsciously, I’ve always believed that, but never actually heard someone express it in that way before. Of course, I’m sure there are plenty of studies that will refute the 1940’s study, but it seems clear that we can’t discount the importance of the brain-to-hand-to-paper function. 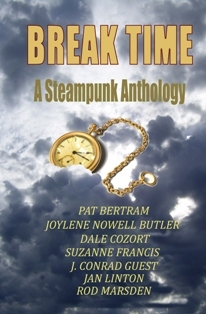 The theme of time travel is timely, considering that Break Time, the steampunk anthology I’ve been working on for the past two years with six other authors, is nearing publication. Yay!! I’ve always enjoyed the conundrum of time travel. In fact, Ray Bradbury’s story “The Sound of Thunder” is one of my all-time favorite short stories. (Hmm. Apparently I’m trying to use the word “time” as many times as possible.) When I first read Bradbury's story, I hadn’t yet studied chaos theory and the butterfly effect, but it seemed logical that one small change millions of years ago would make a difference to us today. Oddly, in the story, everything was still the same in our world after the misstep, though the language was different and a dictatorial candidate won the election instead of the more egalitarian choice. Despite that seeming contradiction, I enjoyed the story and the ensuing mind calisthenics. The way I figured it, since the changes were so minor, it’s just as possible that the dead butterfly affected the passage of the time machine rather than the passage of time itself, and the travelers ended up in an alternate universe. Once a long time ago, I read a story about sightseers from the future who came to watch catastrophes here on earth. (There are several movies with that same theme, but the story I read predated the films by decades.) The tourists could watch the unfolding drama, but could in no way interfere. I used to think that was inhumane, sort of like reporters who simply film the death throes of victims before help arrives without ever pausing to offer assistance. However, when I watched The Final Countdown, my sympathies lay with those who thought it important not to change history by attacking the Japanese before they attacked Pearl Harbor. Who are we to change what was? Sure, all those American deaths would have been prevented, but what other atrocities might have taken their place? Though people consider it a conspiracy theory, the fact is that Roosevelt knew about the attack and let it happen. (A strange aside. People always talk about the Americans having broken “The Purple Codes” but before they were called the purple codes, they were red and various other colors. They were so named because of the color of the folder in which they were stored, not because of any esoteric reason.) Roosevelt’s point was to get the uninvolved Americans into the war. And so, ultimately, many worldwide changes were brought about. In Break Time, Alexander Giston’s wife and grown son are killed in a steam engine accident. He goes back in time to cajole them into taking another mode of travel. They agree, and this time, the aeroship they are in crashes. The third time, they take their own Stratosphere Steamer, the automobile of our particular steampunk era. And yep. It too crashes. This leads me to wonder if perhaps it’s impossible to change the past. If the past will always self-correct. If you are a time travel buff, be on the lookout for Break Time. Meantime, check out “Time's Winged Chariot,” Rod Marsden’s phenomenal article listing time travel movies, books, comics, and television shows. 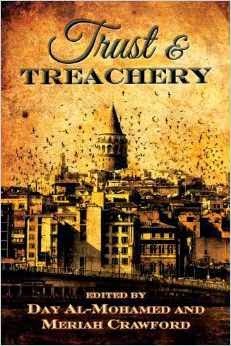 Dark Quest Books and editors Day Al-Mohamed and Meriah Crawford are proud to announce the release of Trust and Treachery: Tales of Power and Intrigue. This long-awaited book will be a part of the Dark Quest Books launch at the upcoming Balticon science fiction convention (www.balticon.org), where several of the authors and editors will be in attendance. “This anthology contains some extraordinary stories that will linger in your mind long after you close the book's cover. The contributors to this anthology explore the delicate dance between trust and treachery across a sweeping variety of genres, time periods, and universes. What happens when you’re betrayed by the person you should be able to trust above all others? The one you love. Maybe even the one who has promised to love, honor, and cherish you. Or even the person who gave you life. What happens when you’re betrayed by the supposedly benevolent institutions that are supposed to protect you? Your government. Your ruler. Your god. What if it’s your own mind that you can no longer trust? 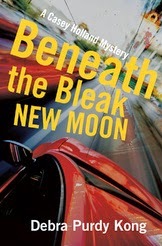 Our hard-working, energetic vice-president of the BC Chapter of Crime Writers of Canada, Cathy Ace, wants everyone to know that the annual Arthur Ellis Awards Shortlist night will be held on Thursday, April 24th in the Peter Kaye room (lower level) at Vancouver’s main public library, 350 West Georgia. The event starts at 7 p.m.
As a former resident of New Westminster, BC, I can tell you that this terrific city has a vibrant artistic community. To that end, the city will be hosting its annual literary festival on April 25th and 26th. There will be presentations, workshops, performances, and exhibitions. A few years back, about twelve of us from the mid-morning writers’ group had gathered together when one of us began yawning. She’d had insomnia the night before, which wasn’t uncommon for her. Another writer said that she hadn’t slept well either, as did another. I’ve always been a light sleeper accustomed to interrupted sleep, so I asked the group how many of them also had sleeping difficulties. Just about everyone raised their hand. Now admittedly, no one in that particular class was under forty and more than half of us were well beyond that, but I found it interesting that, despite chronic sleep problems, all of were still writing regularly. This week, I came across a blog by a writer named Claire Simpson, who wrote about creativity and insomnia. Claire has had insomnia issues off and on since childhood. She maintains that after three hours of sleep, she often feels good enough to write, pointing out that insomnia is not the same as a restless night’s sleep. Claire writes that studies have shown that sleep deprivation can actually help with creativity. Apparently it’s to do with the way our brains are wired. A poor night’s sleep might not be good for analytical thinking, but it can be good for letting ideas come forward. It’s a left brain-right brain thing. Sleepiness lets the right brain bring random, outside-the-box thoughts forward, which often connect with other ideas. This was exciting to read because I’ve experienced this for years, but didn’t realize how common it was in others. After a really bad night, I stay away from heavy editing as I can’t concentrate long enough to make much progress; however, if I let my mind wander and do something mundane like washing dishes, ideas start jumping forth and connecting with current WIPs. For this reason, I don’t really stress anymore after a bad night’s sleep. After thirty years of writing, I can pretty well tell what kind of a writing day I’m going to have based on the previous night’s sleep. This blog is a classic example. I often do my reading and come up with ideas for the next entry on Saturday evening, after a day of errands, chores, and editing. The ideas gel, I make a few notes, and start to write the opening paragraph. But on Sunday mornings, the analytical part of my brain kicks in and the words flow quickly in the order I want them to, most of the time. Incidentally, all you chronic insomniacs should take heart. As Claire points out, Charles Dickens, Marcel Proust, Mark Twain, and Frank Kafka, along with many other famous writers, were also insomniacs. Lately, I’ve come across a couple of articles about successful traditionally published authors whose incomes have been steadily dwindling over recent years. An article The Guardian quotes authors who claim that the credit crunch of 2008 and rapid change in the publishing/bookselling world have hurt their bottom line so much that some of them are in dire straits and facing some tough decisions. The article isn’t talking about aspiring first-time novelists who’ve enjoyed lucky breaks. It’s talking about writers who have an impressive body of work under their belts and multiple awards. The publishers these people work with apparently can’t afford anywhere near the advances they gave before 2008. Book review sections in newspapers and magazines has been drastically cut, the flood of freebie e-books and cheap novels has made books more competitive and ultimately the writers’ bottom line. I’ve been writing for over thirty years, and I’ve seen and heard all this before. The merging of publishing houses all over the world, and especially in North America, over twenty years ago eliminated many midlist writers back then. Midlist writers are disappearing again, and so the cycle continues. In a sciencefiction article, bestselling fantasy author Tracy Hickman told an audience at a conference that he was fighting for his professional life. He stated that he used to have blocks of people lined up at bookstores to buy his books, but with the bookstores dying out his fans can’t find him anymore. Like the authors quoted in the above article, Hickman has to do a lot more work just to scratch out a living, and after thirty years of writing, he’s not sure it will last. And that’s the disheartening part. So many well-known, award-winning authors are now in their sixties and nearly broke. Now they’re wondering not only if their careers will soon end, but what will happen when their meager savings runs out. So, what’s wrong with this picture? The answer is that none of the authors in the two articles have figured out what Joe Konrath and others have. That adapting is not only crucial but quite possibly highly profitable for writers who’ve already created fans and a body of work. Why aren’t they embracing the digital age? Hickman says that he’s lost readers because they can’t find him. Huh? Are all of his fans technically illiterate? Or is it that they know how to find him but there are so many authors now available the digital world that their attention has wandered? In this business adaptability means as much as awards, advances, and lots of published books. It’s about taking those titles and awards and incorporating them into this brave new world. Maybe they should start by reading Joe’s blog.